Luoyang, China (CNN) -- Fifty-year-old farmer Du Jianmin says if it doesn't rain soon in his corner of northern China, his winter wheat crops -- which his village of 120 people relies on for food for the year -- will die. Henan province is suffering one of China's worst droughts in 50 years. One well is rock dry in Luoyang in Henan province, a now parched area that is typically filled with one wheat field after another, and the remaining one is so low that it can provide drinking water only through March. "This is the worst drought I've ever seen," Du, who has been farming in Henan for decades, told CNN. "We only have enough water for a month." 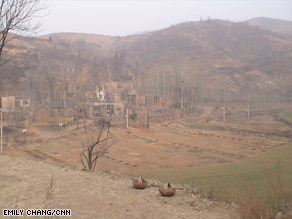 The story of Du's village is one playing itself out across parts of northern China. It is the country's worst drought in five decades, threatening crops in at least 12 provinces. More than 3.5 million people and some 1.7 million livestock are facing water shortages, officials said. Chinese media say the total area affected has reached 1,370 million hectares (3,385 million acres), including the wheat-producing areas in Henan, Anhui and Shandong provinces. Northern and central China have had little precipitation since November. Many places have not had rainfall for more than 100 days. Over the weekend, Chinese soldiers loaded rockets with cloud-seeding chemicals and fired them into the sky over drought-stricken areas in the effort to produce rain. "Drought is indeed very severe, but thanks to the timely and effective efforts we have taken, we have minimized the impact," Vice Minister E Jingping told reporters Tuesday. "If there is no significant rainfall in the next 15 days, the wheat-producing regions will be impacted more severely and we will face a more daunting task." In Ludian, about an hour's drive from Luoyang, farmer Wan Zhangxin said his wheat crops -- which have barely grown because it is so dry -- will be ruined if it does not rain soon. Wan has opted to plant trees for wood to sell and has been watering them by hand with pails. "I'll have to find a job in the city if the drought goes on and the wheat dies," he said. "It has not been raining for a long time. We need to bring out water from house to water the wheat. So we stopped planting wheat." Over the long term, China plans to divert water from its two longest rivers to drought-stricken areas. However, it is still going to be difficult to get water to mountainous areas and remote farmland. Many farms in China rely on rain, because irrigation systems are poor. Although irrigated farms may survive the drought, rain-fed farms are more seriously threatened. Some places are getting 80 percent less rain than they normally do, according to the Flood Control and Drought Relief Office.